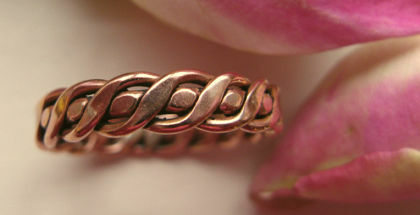 Copper Ring CR015 - Size 6 - 1/8 of an inch wide. > Copper Ring CR015 - Size 6 - 1/8 of an inch wide. Solid Copper Ring CR015 - 1/8 of an inch wide. USA made. Excellent craftsmanship. Very pleased with the beauty and style of Celtic knots. As advertised! Gifted the ring to a young woman & she was delighted!